The Yorkville Rock was purchased for $1500, from a Gravenhurst-area farmer. It was cut into 120 pieces, each one carefully marked for reassembly, and shipped to the Big Smoke on flatbed trucks. The granite rock was placed on a star-shaped, concrete platform, atop the Bloor-Danforth subway tunnel, on the edge of posh Yorkville. 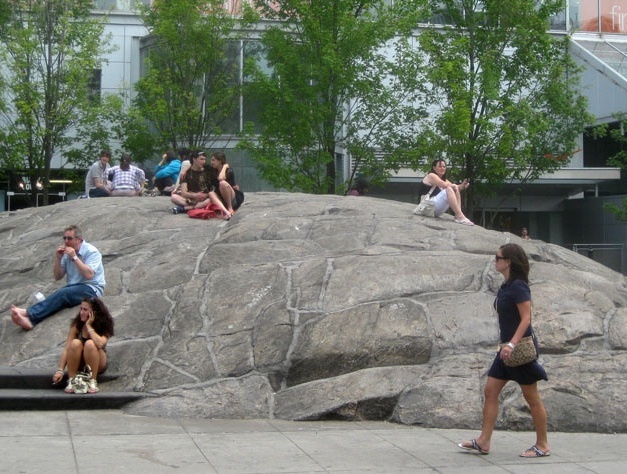 This entry was posted in Cityscapes and tagged Canada, Ontario, The Yorkville Rock, Toronto, Yorkville. Bookmark the permalink. ← Artist AARON LEIGHTON discovers “the fantastical hidden in the familiar”.